Speculation about how much Hereford United will receive for Stuart Fleetwood from Luton has been fuelled by a report in 'Dunstable Today'. They say that 'Town paid League Two Hereford a significant five-figure sum for the services of Stuart Fleetwood'. Whatever the figure, Hereford United have sold one of their highest paid players. Fleets was signed by previous manager Simon Davey from Charlton and it's believed that the striker took a substantial pay-cut to move to Edgar Street. Meanwhile Fleets has tweeted this morning. "Delighted to have signed for Luton Town! Too many people to thank @ HUFC, loved my time there and wish them every success this season!" Finally BN, who have sponsored Fleets during both his spells with the Bulls, will look to move its sponsorship to another player. Hopefully a new deal will be confirmed with the club later today. Stuart Fleetwood has been sold to Luton. The striker has left Edgar Street for Kenilworth Road for an undisclosed fee following a quiet start to the new season. Chairman David Keyte told the official site: "Stuart had a fantastic season last season, he worked tirelessly for the team and was instrumental in helping the Bulls retain their Football League status. "Albeit a step down for Stuart, this gives him a new challenge and opportunity and everyone at Hereford United wishes him every success for the future." Fleetwood told his Twitter followers earlier: "Big stitch up! Loyalty is a dead trait these days, maybe I'm just naïve......"
Luton boss Gary Brabin told their official site that Fleetwood had signed a two year deal: "Stuart is a proven goalscorer this level so I'm absolutely delighted to welcome him to Kenilworth Road. "He's got a great attitude, is a great pro, a poacher and he's exactly one of the types of player I wanted here." Bulls youngster Tyler Weir has told his Twitter followers that he is to remain at Gloucester City until January. The Tigers are currently seventh in the Conf North table after earning ten points from their six games so far. William Hill are offering odds of 9/5 for a Hereford United win over Dagenham on Saturday. Best price for a draw is 12/5 which is available with several bookies. Robert Madley from West Yorkshire is set to referee Saturday's League Two game at Edgar Street where Dagenham and Redbridge will be the visitors. It's the young referee's second season at League level. The Bulls have met Madley once before. That was last February when Lincoln were the opponents at Edgar Street. The Bulls lost that game 1-0. To date this campaign Madley has been in charge of three games and has only given out two yellow cards. Swindon forward Leon Clarke did not show up for training today after his bust up with Paolo Di Canio last night. Robins chairman Jeremy Wray says the player will leave on loan when the window reopens in a weeks time. The Robins signed another player today with West Ham youngster Ahmed Abdullah arriving on loan til January. The 19 year old, who was born in Saudi Arabia, is primarily an attacking midfielder. Di Canio has dispensed with one player, with defender Kevin Amankwaah departing by mutual consent. Also leaving the County Ground is midfielder Michael Timlin, who returns to former club Southend on loan until January. The 26 year old had an eight game spell at Roots Hall last season. Northampton have sold striker Shaun Harrad to Bury for an undisclosed fee. The former Burton man cost the Cobblers a reported £35,000 and has signed a three year deal at Gigg Lane after rejecting interest from Rochdale. Rotherham have signed striker Alex Revell from Leyton Orient for an undisclosed fee. The 28 year old scored 16 times last season for the League One bottom side. Former Bull Sam Gwynne has joined Welsh Premier big spenders Neath. The 23 year old had been on non-contract terms with Westfields, and played over 80 times for the Bulls since debuting in February 2006. Aldershot have signed West Ham youngster Jordan Brown on a months loan. The 19 year old left back is yet to make his senior debut. Bradford have further bolstered their ranks with the loan signing of Hull winger Jamie Devitt until January, and keeper Matt Duke on a two year deal. 21 year old Devitt has played 30 times in loan spells with Shrewsbury, Grimsby, and Darlington. 34 year old Duke left Hull in the summer after seven years. Northampton have extended the loan of defender Kelvin Langmead from Peterboro until January, and extended the month long contract of veteran Ashley Westwood until the end of the year. Oxford striker James Constable is reported to have rejected a move to Bournemouth after the clubs agreed a fee. The Cherries are now claimed to be making a move for Crawley's Matt Tubbs. Southend have reached an agreement with Crystal Palace to terminate the loan deal of midfielder Alassane D'Diaye. The 21 year old had a dressing room bust up that has seen him excluded since. Oxford have signed striker Jonathan Franks on loan until January. The Middlesboro 21 year old has made 30 appearances for the Championship side and was an England u19 international. Loan keeper David Cornell has extended his stay at Edgar Street until the end of the season. The club have confirmed the move after Adam Bartlett re-injured his thigh last night. Cornell, 20, started three games and made a sub appearance in the fourth since arriving on an initial months deal. The Bulls have confirmed the departure of youngster Kyle McCarthy. The Welsh u19 youngster signed a pro deal in the summer after coming through the youth team last season. Rumours of his departure surfaced at the end of last week. Hereford United manager Jamie Pitman spoke to the press after last night's 4-1 defeat at Bournemouth. "The young lads got tired and that had an impact on the game," said Pitman. "But I was pleased with the way we played, particularly in the first 45 minutes. "The problem was that we could not cope after the break. We got tired in the end and ragged and you cannot do that against opponents from a higher division. There is no doubt I am going to have to get the team a lot fitter than they appear to be at the moment. "Adam had a thigh strain which he needs to get sorted out and that did not help us, but the truth is that after a bright start we fell away. I was pleased with Barkhuizen who did well in the first half but fitness was a key factor in the outcome." Tickets for the trip to Shrewsbury on September 10th are now on sale from the club office. The Bulls have an allocation of 1,048 for the all-ticket game. Adult tickets are £17, Over 65's, Disabled, and Students £12, Children 12-16 £10, and Under 12's £4. Family tickets are also available. Tickets will be available before Saturday's game with Dagenham up until 11am on the Friday before the match. Postal orders will be accepted until the office closes this Monday. Ticket holders will be required to sit in their allocated seats. Plymouth have signed Gillingham defender Simon King on a one month loan deal. The former Barnet man has been with the Gills for four years but hasn't played this season. Port Vale forward Lewis Haldane broke his leg in last night's penalty loss to Tranmere and will have an operation on it today. The former Bristol Rovers man has a double fracture near his ankle. Barnet have rejected an approach from Charlton for former Bulls loanee Mark Marshall. The winger, 24, is also said to be interesting Crystal Palace with the Bees saying they will not stand in his way if the right offer comes along. Accrington have signed Colchester forward Tom Bender on loan for the season. The teenage Welsh u21 international has made only two sub appearances for the League One side. Macclesfield are reported to have rejected bids from unnamed clubs for striker Emile Sinclair and defender Tony Diagne. Bradford are claimed to be chasing former Hull keeper Matt Duke. The 34 year old was released by the Tigers earlier in the summer. Bristol Rovers have loaned midfielder Ben Swallow, 21, to Bath for three months. Luton are doing a good impression of the pot calling the kettle black after slamming Forest Green for being unprofessional over their offer for Robbie Willmott, while manager Gary Brabin tells the press that Gumpers striker Reece Styche was 'desperate' to join the Hatters. Forest Green chairman Dale Vince has said he has made a second bid for Willmott. Macclesfield have sold striker Emile Sinclair to Peterboro for an undisclosed fee. The former Nottm Forest man has signed a three year deal after bagging four goals already this season. A number of clubs were chasing the player, with Watford earlier claimed to have lodged a £300,000 bid. Bradford have signed striker Terry Dixon on a one year deal. The 21 year old will join their development squad but has already been loaned to Halifax Town for a month to gain experience. Plymouth have signed Ipswich teenager Jamie Griffiths on a months loan. The 19 year old midfielder signed a short term pro deal with the Tractorboys in the summer after recovering from a back injury. Port Vale have signed utility player Andrew Little from Rangers on loan until January. The 22 year old has played 14 times for the SPL side. Bradford have signed teenage defender Dean Overson on a two year deal. The 18 year old former Burnley trainee is said to be the final member of the Bantams' development squad. After a promising first half display, United produced a second period surrender that saw them lose 4-1 at AFC Bournemouth last night. An early goal by Tom Barkhuizen was cancelled out before the break and then a second half weakened by substitutions saw three further goals by the hosts. Jamie Pitman gave starts to his three new loan players. Will Evans started at right back, Barkhuizen on the right of midfield and Sam Winnal up top with Arquinn. Stefan Stam and Adam Bartlett both returned from injury. Marc Pugh wore the seven shirt for The Cherries. The Bulls started brightly with Arquinn feeding Winnal but his strike was cleared for an uneventful corner. Then Evans played a long ball down the flank for Barkhuizen who got past his marker before crossing. Then twelve minutes into the game The Bulls took the lead with a well-worked goal. Kenny Lunt chipped a ball forward to Arquinn who made a determined run down the left before his driven cross was met by Barkhuizen who tapped in at the far post. Marc Pugh jinked his way into The Bulls’ box box his shot from fifteen yards went straight to Bartlett before nippy Nathan Byrne got a cross in from the right, which Hereford scrambled to safety. Arquinn’s hard running almost produced a second goal when he got to the ball before the keeper but his squared pass was cut out just before Lunt, who was charging into the box, could stab home. The Bulls continued to look a good match for their higher graded opponents with Arquinn causing problems with his height and speed while Harry Pell was always looking to break forward from midfield. Lunt played a delightful through ball to Winnal and the incomer helped it on to Arquinn who should have don e better than blast over from inside the box. Then just before the break, Pugh levelled for Bournemouth when he turned inside Evans to fire past Bartlett from 12 yards. Hereford emerged for the second half with Cornell replacing Bartlett that fuelled speculation the thigh strain may not have fully healed. A short corner routine produced a cross that Stam headed over at the back post before Bryne, again dangerous down the right, produced a cross which deflected away by the defending Lunt. Pell produced a surging run that finished with a goal-bound shot that was blocked before a similar driving run saw his effort go over the bar. Sam Winnal also went close with a snap shot. Fleetwood replaced Arquinn after an hour and five minutes later the hosts took the lead. The ball was worked quickly from the midfield when Fleets lost possession and striker Doble slipped the ball between Stam and Townsend for substitute Stockley to fire past Cornell. Ten minutes later it was two when Pugh combined with Stockley for the striker to net again. Pugh cut in from the left but his low shot skidded wide of the post and the fourth arrived with eighty-five minutes on the clock. Heath played the ball out towards Mcquilkin but the combination of an under-hit pass and Quilks’ hesitancy allowed MacDonald to pinch the ball and shoot home from well outside the box. Kenny Lunt rolled passed two defenders in the box to square the ball back to McQuilkin but James’ rising shot was high over the bar from just inside the area before the referee sent the crowd that included around eighty hardy souls from The Shire on their way home. Hereford: Bartlett (Cornell 46), Evans, Stam, Townsend, Heath, Barkhuizen, Lunt, Pell (McQuilkin 71), Clist, Winnal, Arquin (Fleetwood 61). Subs unused: Featherstone, John. This was very much a case of “a game of two halves”. In the first half United were easily as good as the hosts but following the withdrawal of Arquinn and Pell after an hour, the pace and urgency completely went out of the side which made it a disappointing evening for the travelling fans. Evans started well but unsurprisingly, Pugh got the better of him later in the game while Winnal and Barkhuizen were promising until the disruption of the substitutions. It must be hoped that the changes were prompted by the bigger picture of saving the team for the League match on Saturday against The Daggers. The £4.50 carvery in The Bull at Downton was, however, excellent. It was bound to happen sooner or later, but Swindon's stellar appointment of Paolo Di Canio is really starting to fall apart. After just one win in five League matches, against Crewe on the opening day, and following being dumped out of the Carling Cup tonight against Southampton, Di Canio showed the pressure by having a confrontation with recent signing Leon Clarke. The fiery Italian and the former QPR man, a Swindon player for just 11 days, ended up being parted in the tunnel after tonight's loss. The video can be seen here. Here are the main stats from this evening's Paint Trophy match at Dean Court. Attendance: 2489 with 104 in the away end. The Bulls dipped out of the Johnstones Paint Trophy with a 4-1 loss at Bournemouth tonight. Jamie Pitman handed starts to loanees Will Evans, Tom Barkhuisen, and Sam Winnall, as well as recalling Stefan Stam and Adam Bartlett from their injury problems. Bartlett managed only the first half, being replaced at half time by David Cornell. 104 Bulls made the trip to Dean Court. Bulls full back Joe Heath has been named in the Team of the Week for his performance at Bristol Rovers at the weekend. The former Exeter man is the first Bulls player to get a nod this season. He is joined in the XI by Pirates keeper Scott Bevan as well as two men each from Macclesfield and Bradford. "Russell Hoult, the assistant manager, is a good friend of mine and we had a chat recently and he has said that the squad there is working hard for manager Jamie Pitman and they will be a threat. It's an important game for us as we look to get back on track, and we know the importance of what a good result can do for us." The pair had a year together at Portsmouth ten years ago, with Bradbury signing a deal to become the Cherries' manager last January. On the pitch, Bradbury has few injury concerns for tonight's game. Loanee Scott Malone picked up an ankle injury at the weekend and is unlikely to be risked, while veteran Steve Fletcher faces a late fitness test. Midfielder Steven Gregory and loan striker Ryan Doble are expected to return after injury, while second string keeper Shwan Jalal is likely to start. The Bulls travel to Bournemouth tonight for a Johnstones Paint Trophy match. The two sides have met in only one League season in the last 30 years. During the 09/10 season both games ended up as 2-1 wins for the home side with the Bulls victorious at Edgar Street thanks to a Marc Pugh double, and the Cherries winning at Dean Court thanks to a Brett Pitman brace. Pugh also scored in that game, six weeks before he joined them on a two year deal. The Cherries have had a slow start to the current League One season under manager Lee Bradbury, winning just one of five League matches. They hammered five past Dagenham in the Carling Cup before being downed 4-1 at home to West Brom last week. Club owner Eddie Mitchell has had to defend himself against claims of asset stripping after the club sold four players over the summer, including banking £1million for teenage forward Danny Ings, while half of their summer arrivals have been on loan. The Bulls will travel south expected to make several changes for the 'mickey mouse' competition. While competition rules - and the current injury crisis - will prevent wholesale changes there is expected to be some movement in the starting XI after playing every midweek since the start of the season. New loanees Sam Winnall, Tom Barkhuizen, and Will Evans will be looking for first appearances for the Bulls, while the likes of James McQuilkin and Joe Colbeck will be looking for a swift return to action after being omitted on Saturday following quiet performances at Villa Park. After just seven games only three players - Delroy Facey, Harry Pell, and Ryan Green - have started every match for the Bulls. AFC Bournemouth vs Hereford United, Dean Court, Tuesday 30th August, 7.45pm. Wrexham's Supporters Trust are investigating claims on the Red Passion forum that local councillor Phil Wynn is arranging a rival bid to their offer. Former player Alan Bermingham has already failed in one bid to buy the club two weeks ago, but is now claimed to be lining up a second bid. That bid is said to keep current director Jon Harris, the subject of a leaked email last week, in his job. Bristol Rovers boss Paul Buckle says he expects striker Jo Kuffour to leave this week. Buckle was criticised for substituting the former Bournmouth man at the weekend, but he said afterwards he expected the player to leave for a club closer to London. Wingers Ben Swallow and Charlie Reece are also available, but Buckle says any transfers inwards would have to hinge of a move for Kuffour. Former Bulls forward Guillem Bauza will miss several weeks with an ongoing groin problem. The current Exeter man has had a stuttering pre-season with the problem. Crawley striker Matt Tubbs is claimed to be a target of Crystal Palace and Charlton. The 27 year old has scored 44 times in 53 games for Crawley, including four goals this season. Jamie Pitman will rest several players for this evening's Paint Trophy match at Bournemouth which will allow him to use the game to give starts to his latest three recruits - Sam Winnal, Will Evans and Tom Barkhuizen. However he can not make wholesale changes, even if he had enough players, as the rule state that he must have at least six regular first team players in the starting line-up. He may also consider giving Stefan Stam and Rob Purdie at least sometime on the pitch. Both are recovering from injuries. However Bruno, Benoit Dalibard, is still a doubt as he recovers from a hamstring problem. Kidderminster are up to third in the Conference after beating Newport 3-1. The Exiles had two men sent off for the second game running. Forest Green are seventh after a 3-0 home win over Bath City, who are now bottom of the table. One place above them are Grimsby, who lost 1-0 to Gateshead to leave them with just one win in six games. In Conf North Gloucester lost their first game of the season at home to leaders Hyde 2-0. Tyler Weir was booked for a late tackle and, according to the SportGlos report (link) was lucky to stay on the pitch. An article on the Bristol Evening Post website has asked a question quite a few have been pondering - what was Paul Buckle thinking in letting Harry Pell go? With two days left of the transfer window, Wimbledon boss Terry Brown says he will be doing no more business. They have been struggling for cover in the centre of defence, but hope to have summer signing Mat Mitchel-King fit in the next week. Port Vale have loaned teenage keeper Sam Johnson to Stafford Rangers for a month. The 18 year old signed his first pro contract this summer. Southend striker Liam Dickinson needs surgery to cure an ankle problem, but is hoping he can delay it until the end of the season. Aldershot have opted not to extend the loan of midfielder Jake Taylor. The Reading teenager played four times for the Shots during his month at the Recreation Ground. Rotherham boss Andy Scott says he still intends to sign another striker after bagging Reading forward Brett Williams on loan. Swindon boss Paolo Di Canio accused his players of lacking heart after Saturday's loss to Shrewsbury. The Italian told the press: "This is not the group of professionals that I want to see on the field." Crewe boss Dario Gradi held talks with departed Plymouth defender Stephane Zubar over the weekend, but the Frenchman wanted more money than the veteran boss could offer. Zubar quit the Pilgrims last week after not being paid since the start of the year. Current trialist Richard Hinds is said to be interesting Crawley. Bradford boss Phil Parkinson has made his first signing, bringing in winger Kyel Reid on a two year deal. The 23 year old was signed by Parkinson for Charlton in Jan 2010 but released this summer. Barnet have 'reluctantly' turned down Cameroon's request for defender Clovis Kamdjo to join their u23 training camp. The 20 year old is a regular at Underhill and they don't want to lose him. Bradford have named Phil Parkinson as their new manager on a two year deal. He left Charlton in January and was odds-on favourite for the post almost as soon as Peter Jackson tendered his resignation. The 43 year old started out with Colchester, earning them promotion into the Championship before a six month spell at Hull ended with the sack. His time at Charlton saw them relegated to League One and he failed to get them back up. The Bantams are in talks with Charlton striker Paul Benson over a six-figure move. Parkinson took him from Dagenham to The Valley, but the 31 year old has been a fringe player since Parkinson's departure. 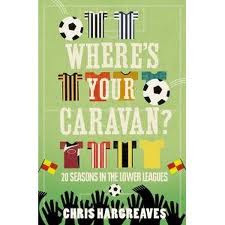 Chris Hargraves's new book 'Where's Your Caravan' has just been released and to help promote it the former Hereford United player has taken part in a question and answer session with Bulls News. What was the attraction of joining Hereford United back in 1996? After Hull and West Brom, didn't you find Hereford a bit sleepy, especially the night life? Very sleepy but I was still living in Birmingham so there was no problem there !!! Best goal you scored for Hereford? Probably a volley against Cambridge away, or the winner against local rivals Cheltenham, I think on Boxing Day. How did you get on with manager Graham Turner? Really well, Graham is a great person and a very good manager. I have the up most respect for him and am delighted that he was able to turn the club around. Who did you rate a player, if anyone, at Edgar Street whilst you were there? Gavin Mahon was clearly a decent player, as he has gone on to prove. Gav or Billy as we used to call him was very quiet but he was also extremely determined, and as he got stronger you could see that there was real potential there. Jamie Pitman was a youngster in the team - did you ever think he would become manager of Hereford United? Incredible, 'Jenny' is a top lad and I am really pleased for him that he has got the job. I didn't see him going into management at all, but as they always say 'It's a funny old game' and I think so far so good. How did you feel the day the Bulls were relegated to the Conference - the Brighton game? It was the single worst moment of my football career. The build up was horrendous and the sense that Brighton could escape just wouldn't go away in the media. The changing room was like a crime scene afterwards. I felt sick to the pit of my stomach and was gutted for the club, and personally I had essentially dropped four leagues in a season. It was a brilliant moment for me to see the club deservedly promoted back into the league. There was a period in 1997/98 when the squad wasn't paid for some weeks - Did you think what the hell am I doing here? For a few minutes yes !!!!! But I have always tried to be supportive of the club I have been at during my career, there were plenty of people not getting paid and we were always going to get our money, but I did have to laugh during those times when a fan shouted to one of our players (who has to remain nameless) after a game "You didn't really earn your money today sunshine did you" - or words to that effect!! to which he replied "No I played for free today mate anyway !" The First Fitness Stadium (Dean Court) is a modern all-seated three-sided stadium with plans for a permanent fourth stand in the pipeline. Visiting fans are housed in part of the East Stand where there is provision for around 1200. Admission is £10 for adults and £5 for all concessions including students. HUISA are understandably not running a coach to this game as demand is expected to be low. The FUNBUS will leave from Wetherspoons in Commercial Road at around 3.15pm. At the time of writing, there were about 5 seats available. Fare will be calculated by dividing the total cost by the number of travellers (expected to be no more than £20). Anyone wishing to travel should Email Cpowis@aol.com no later than Monday evening or contact any of the Funbus regulars. BY CAR - Travel to Gloucester then follow signs for Cirencester and on towards Swindon. At the M4, go straight on following signs for Marlborough (A346). Continue through Tidworth and from Salisbury, follow signs for Fordingbridge/Ringwood (A338). From Ringwood, follow signs for Bournemouth (A338). The A338 will take you straight to the ground with a turn off at the roundabout into Kings Park Drive (Signposted Dean Court). Distance is just over 130 miles and you should allow upwards of three hours. Postcode is BH7 7AF. Alternatively, from Swindon, take the M4 east (sign London) and continue to junction 13 where you join the A34 south (sign Newbury). Continue on the A34 to join the M3 at junction 9 (sign Southampton). At M3 J14, take care to continue on the M3 to join the M27 west and then the A31 following signs for Bournemouth. After the Ringwood interchange take the A338 as above. REFRESHMENTS – The East Stand has a concourse providing refreshments, a bar and Sky TV. Around the ground, the Pubs like the Green Park and The Dolphin often operate a home fans only policy so you may be better off trying the many Pubs and bars on the Bournemouth seafront. One Pub that comes highly recommended is The Goat & Tricycle at 27 West Hill Road where you will find a fine selection including Exmoor, Badger and Theakstons. In the city centre, you will find The Moon in The Square at 4/6 Exeter Road ('Spoons), The Pig and Whistle in Queens Road where you’ll find a decent pint of Ringwood Best and a vastness of fizzy beer outlets. It's probably a good bet to find a boozer between Salisbury and Ringwood. In particular, The Crown and The Ship at Fordingbridge or The Fish at Ringwood which is a riverside food Pub with usually three ales on. The nearest chip to Dean Court appears to be The Galley at 346 Holdenhurst Road which is a good walk from the ground. No trains to Shrewsbury Town. Saturday 10th September would have been, arguably, the rail company's busiest and most profitable day on the Hereford to Shrewsbury line but it seems they have chosen this date to do maintenance work on the track. The service will be replaced by buses. Bulls' fans will therefore need to find alternative transport to The Gayhous. It is also the weekend of the Ludlow Food and Ale Festival so the rail chiefs certainly seem to have chosen the weekend without much thought for the people that actually use the service. HUISA will run as many coaches as are required. Northampton have denied rumours that boss Gary Johnson quit the club after yesterday's home loss to Morecambe. Johnson did confirm rumours that striker Shaun Harrad is likely to leave with Rochdale claimed to have put in an offer. Rotherham are to sign Reading striker Brett Williams on loan until January after Adam Le Fondre went the other way yesterday. 23 year old Williams was signed from Conf South side Eastleigh in January and is yet to make his FL debut. Grimsby joint manager Rob Scott rounded on fans that criticised his side after yesterday's loss to Darlington. The incident was recorded and put on Youtube (here, language warning!) leading to chairman John Fenty to criticise elements of the crowd that were singling out players. Northampton have put out a call for witnesses after a car park attendant at the club was robbed of cash shortly before kick off of their game yesterday. Wrexham boss Dean Saunders has issued a statement saying he will seek assurances from the Supporter Trust over their planned running of the club before committing to their takeover. It is widely expected that the Trust will have to cut costs at the club in order to stem losses. Fleetwood are reported to have paid Halifax £100,000 for striker Jamie Vardy. Brendan Malone has been appointed to referee Tuesday evening's Paint Trophy game between Bournemouth and Hereford United. The Bulls last met Malone at Torquay in February. Stuart Fleetwood was in good form that evening, bagging a brace, and Nicky Featherstone also found the back of the net in a useful 3-1 victory. To date this season Malone has been in charge of five games in which he has dealt out 27 yellow cards and one red card. Yesterday at Northampton, where Morecambe were the visitors, he nearly ran out of ink as he wrote eight names in his little book. Gate prices for the game are £10 for adults and £5 for concessions. Please note HUISA is not running a coach to this game. Stan James is offering a price of 19/4 for a Hereford United win at Bournemouth next Tuesday evening in the Johnstones Paint Trophy tie. Best price for a draw is 11/4. That's with Stan James and SkyBet. Prices from Oddschecker.com and are subject to change. The Bulls came away from The Memorial Stadium with a hard-earned point this afternoon but must wonder why referee Mohareb failed to award a spot kick when Kenny Lunt was felled the box in the second half. Jamie Pitman, with a string of new loan signings at his disposal chose to leave them on the bench as Youann Arquinn made his first start and Kenny Lunt made a return to the opening eleven. Stuart Fleetwood and Adam Bartlett joined the incomers of Sam Winnal, Will Evans and Tom Barkhuizen on the bench. In the opening attack former Shrewsbury striker Matt Harrold introduced himself to Ryan Green with a straight forearm into the face but undeterred, Greener calmly won possession and cleared upfield. A neat move involving Pell and Lunt produced no more than a throw before a Rover’s corner was safely gathered by Cornell. Heath’s miss-control presented a chance to McGleish but the Gas’ striker fired straight at Cornell. Former Bull, Craig Stanley, lobbed a ball over the top but Kuffour was well off target. Arquinn and Facey combined well down the left but Facey’s cross was over-hit and went out for a throw as the strong wind made measured passing very difficult. Pell was sent on a driving run by Lunt but dragged his shot wide of the goal. As Pell started to pull the strings in midfield, his work was interrupted by a disgraceful late challenge from Gill who deservedly collected a caution from the referee. Heath put in a fine cross which Delroy would probably have got too were it not for a crafty nudge in the back which, of course, went unnoticed. Kenny Lunt’s quick throw-in almost caught the Gassers unaware but Virgo was on hand to scramble the ball away. The referee provided another example of inconsistency when a dangerous Stanley challenge on Lunt went unpunished but thirty seconds later he carded Harry Pell for a late tackle on McGleish. Former Bulls’ trialist Zebroski then picked up a yellow for his challenge on Nicky Featherstone before a Craig Stanley free kick was headed back across the goal by Harrold but the strike from Gill went well wide. Cornell had to be alert to tip a drifting cross away as the wing continued to play havoc with ball more than a foot off the ground. Kenny Lunt had a chance early in the second half but decided to try to slide a ball to Featherstone when a shot on goal was probably the better option. Facey, with a fine turn of pace, tricked his way past his marker to win a corner and Lunt’s accurate flag-kcik was headed just wide by Townsend. A Harrold header brought a low save from Cornell before Facey was hauled to the ground when reaching for a pinpoint cross from the overlapping Danny Williams. Again, the referee waived away the Bulls’ appeals. Fifteen minutes into the second period, Pell let fly from 30 yards but his effort bounced off the far post to safety with home ‘keeper Bevan beaten. A Clist/Lunt corner routine produced a chance for Arquinn but his back post header was just wide. Anthony headed over for the hosts and another deep corner from The Gas was comfortably collected by Cornell before the referee bottled a penalty claim by The Bulls. Facey crossed from the left and Arquinn controlled the ball and pulled it back to Lunt who was bursting into the box. With a clear sight of goal and as he shaped to shoot, Lunt was bundled to the ground from behind but the referee once again sided with the home team. Danny Williams was starting to get forward more and delivered a fine through ball to Arquinn who whipped in a cross which looked destined for Clist to nod into the open goal before Anthony threw himself into a despairing clearance header. In a similar move, Willians again fed Arquinn and this time it was Pell who fizzed a shot just over the bar from 30 yards. As the game drew to a close, Harrold saw his shot saved by Cornell and Simon Clist was unlucky when his clipped cross was inches wide of drifting in at the far post. Hereford: Cornell, Williams, Green, Townsend, Heath, Lunt, Pell, Featherstone, Clist, Facey (Fleetwood 79), Arquin. Subs unused: Bartlett, Evans, Barkhuizen, Winnal. Bristol Rovers: Bevan, Smith (W Brown 59), Anthony, Virgo, L Brown, Zebroski, Stanley (Campbell 54), Gill. Kuffour (Carayol 65), McGleish, Harrold. Subs unused: Cronin, Richards. Hereford United manager Jamie Pitman was 'very pleased' to take a point at Bristol Rovers this afternoon. "We defended very well today and ground out a very good point," Pitman told BBC Hereford and Worcester. "It'a very tough place to come. Paul Buckle knows how to organise his teams well. "We've come under a bit of pressure but we've had our moments as well. "It was blustery out there but that's something you've got to cope with. "This is a result for us to build on. We restricted Rovers to very few chances." Pitman gave a first League start to striker Yoann Arquin in place of Stuart Fleetwood. "He did very well. Him and Delroy were a threat all day. They stretched the game but they need to break forward a little bit better." Keeper David Cornell had another good game. Pitman was asked whether he might try and extend his loan. "I haven't spoken to them (Swansea) yet. He's come in and it's early days. He's done very well. "But I've got a good goalkeeper in Adam Bartlett. "We'll have to decide financially if we can keep him." Most managers blame something or other when they don't win a match. This afternoon Bristol Rovers manager Paul Buckle blamed the very dry Memorial Pitch for failing to take three points from Hereford United. The pitch was watered beforehand and again at half-time. "I couldn't believe what it was like and it's a lesson learned for the future," said Buckle. "When I was at Torquay I always insisted on a slick surface and I want the same here. There is nothing a visiting side like more than a pitch which slows up the play. "It sounds like an excuse but it's actually a reason why we didn't get better crosses into the box from the right in the first half. "The ball kept bobbling up and hitting shins. Players like Jo Kuffour and Chris Zebroski enjoy a fast surface and this one didn't help them one bit." Here are this afternoon's main stats from the League Two match at Bristol Rovers. Theo Robinson scored for Derby but they lost at home to Burnley. Ryan Valentine was booked for Telford as they beat Newport, with Glyn Thompson making his first appearance of the season for the Exiles after coming off the bench. The Bulls remain one off the bottom in League Two, but the side below them has changed. Plymouth are now 92nd in the League after losing to Crewe 1-0, with the Railwaymen moving on to three points. Swindon are also on that number after another loss, going down 2-1 at Shrewsbury despite taking the lead. Three sides are on four points with Bradford beating Barnet 4-2, Aldershot drawing 1-1 at Oxford with ten men, and Northampton losing 2-0 at home to Morecambe. The Shrimps are second in the table after four wins in five, with only Rotherham above them. The Millers, without Adam Le Fondre, beat Gillingham 3-0, but the shock of the day was at Cheltenham where the Robins beat Crawley 3-1 to become only the second team to beat the Red Devils in 2011 (the other was Man Utd). The Gills are fourth behind Crawley, with Dagenham fifth after a 1-1 draw with Torquay. In other games Accrington beat Burton 2-1, Southend won 3-2 at Port Vale, and Macclesfield beat Wimbledon 4-0. In the Conference Wrexham's 4-1 win at Alfreton puts them top of the table, while Gateshead kept up their early form with a 2-1 win at Barrow. Telford beat nine-man Newport 2-1, Kidderminster beat Southport 2-0, and Forest Green drew 1-1 at Ebbsfleet. The Bulls earned their second away point with a creditable goalless draw at Bristol Rovers. While the Pirates had the majority of the chances they couldn't break down the stubborn Bulls back line that frustrated Aston Villa for so long in midweek. Jamie Pitman handed a first start to Yoann Arquin, while Joe Colbeck and James McQuilkin were out of the matchday 16 entirely. Rotherham have sold striker Adam Le Fondre to Reading. The fee is claimed to be an initial £350,000, plus clauses, with Rochdale due 20% of the profits after selling him to the Millers for £150,000. Wimbledon have signed former Crystal Palace midfielder Kieran Djilali. The 20 year old ended last season on loan at Chesterfield and had an unsuccessful trial at Bradford earlier in the summer. Bradford have a three man shortlist for their new manager. Former Charlton boss Phil Parkinson is said to be the no.1 target by the local press, with Aidy Boothroyd also on the list. Former Bull John Brough, now heading up Cheltenham's youth section, says he has wasted a month working on a 'hoax' sponsor. The Robins' youth setup is struggling for money and faces closure without investment. Wrexham's Supporters Trust has had to issue an apology after an internal email, questioning the relationship between manager Dean Saunders and board member Jon Harris, was leaked to the press. Harris, who received the email legitimately, says he forwarded it to the current club owners and they are suspected to have leaked it. AFC Wimbledon's Jack Midson has praised Bulls loan man Simon Clist, and has blamed Oxford boss Chris Wilder for both of them leaving the Kassam Stadium. "It was more down to the manager than anything else. When you are out of favour with someone then you are not in the team and I was in and out like a yo-yo. He (Wilder) seems to be like that with six or seven players. It happened with Simon Clist, he is a very good player, but his face did not fit so the manager got rid of him." Blackpool manager Ian Holloway appears pleased that Tom Barkhuizen has joined Hereford United on loan. "That’s a sign of the times," he said. "It is great for us to have some lads who are actually good enough to go out on loan to other clubs and play in their team. "We are used to borrowing other people’s youngsters. Now we can loan them out to others and I’ve got more good young lads who I am willing to loan out too, so we can keep them ticking over." "The joint administrators of Plymouth Argyle Football Company Limited (in administration) are satisfied that Bishop International Limited has secured the necessary funding and everything is agreed between the numerous parties. "Solicitors are now working to finalise the documentation and complete the sale to Bishop International Limited / Plymouth Argyle (125) Limited." It is now expected that the club will receive ratification from the Football League and will eventually end up in the ownership of Peter Ridsdale. Meanwhile, Bristol Rovers have signed defender Danny Woodards on a one year deal ahead of tomorrow's game. The former Exeter man left MK Dons in the summer after turning down a new deal. Hereford United manager Jamie Pitman should have 16 fit players for tomorrow's League Two game at Bristol Rovers. Whilst he will still be without Adam Bartlett (he has returned to training), Stefan Stam, Rob Purdie and Bruno (Benoit Dalibard), there will be a welcome return for Simon Clist who had to sit-out last Tuesday's Carling Cup-tie at Aston Villa. The Bulls now have five loan players. They are keeper David Cornell from Swansea, left-winger Simon Clist from Oxford, central defender Will Evans from Swindon, striker Thomas Barkhuizen from Blackpool, and another striker Sam Winnall from Wolverhampton. Pitman says he's not sure of his best starting eleven just yet. "We need a bit of patience," he told the Worcester News. "We know we have got a good enough squad to see us safe this year, we just need a bit of time to get everybody available so we can field a consistent team." Meanwhile speculation that youngster Kyle McCarthy has left the club has not been confirmed. McCarthy was on the bench at Villa Park last Tuesday. Sam Winnall has joined Hereford United on a one month emergency loan deal from Wolves. The 20 year old striker is able to play at Bristol Rovers tomorrow. To date he has had one first team appearance for Wolves in their Carling Cup victory over Southend last August. He had a spell on loan at Burton Albion last season scoring seven goals in twelve appearances. Winnall joined the youth ranks of Wolverhampton Wanderers as a teenager, before signing professional forms in May 2009. He recovered from a cruciate knee injury to make his senior debut on 24 August 2010 in a League Cup victory over Southend United. He is contracted to the Molineux club until summer 2013. In February 2011 he moved on a month's loan to League Two side Burton Albion, later extended to the end of the season after a run of four goals in six appearances. Bristol Rovers could be a bit fragile up front on Saturday with several of their forwards needing treatment. With winger Joe Anyinsah already ruled out, strikers Matt Harrold and Chris Zebroski were both withdrawn during their penalty win over Watford with injuries. Both have returned to training but will be assessed before the starting lineup is named. Also definitely out are defenders Cian Bolger, who also limped out of Tuesday's game with an ankle problem, and longer term casualties Stuart Campbell and Gary Sawyer. Matt Harrold spoke to the Bristol Evening Post about the game: "It's games like this that are dangerous – ones where everybody is expecting you to win. "There was probably a little bit of that ahead of our home game against Torquay the other week – even though they had done well last season. People turned up thinking we would win and, as we found out, it doesn't happen just like that. "I'm sure the manager will be telling us how important this game is. If we perform, then we can win it – but we have to be bang on it and we can't have any complacency at all." For the first season for some time, the Bulls paid agents last term. The annual Football League report into agents fees shows the Bulls paid out £23, 730 last season. The Bulls, under Graham Turner, had previously been reluctant to shell out money to agents - so it is odd to see Turner's Shrewsbury topping the pile with £43,084 paid out. The Bulls were third in the League Two table of payments, with Southend between them and the Shrews. Seven sides, including Stevenage and Cheltenham, paid nothing to agents. Newcomers AFC Wimbledon and Crawley also say they paid no fees last season. The Bulls total player transactions, including loans and contract updates, numbered 50 with only Bradford (53) recording more. The full report, in PDF format, is here. In addition to loaning Will Evans to the Bulls, Swindon have allowed young striker Billy Bodin to join Torquay on loan until January. The 19 year old Welsh u21 international has slipped down the pecking order at the County Ground since Paolo Di Canio's summer signing spree. Stockport have issued a statement saying their planned takeover has been delayed after investor Tony Evans raised issues at a meeting last week. The club says the deal is still expected to be completed. Bradford have put assistant boss Colin Cooper in temporary charge for this weekend's game with Barnet. They will seek a swift replacement for Peter Jackson, but Cooper is expected to be in charge for next weekend's game as well. Burton have announced the signing of Torquay striker Billy Kee on a two year deal. The Gulls say the former Leicester trainee was homesick and wanted a return to the Midlands, with an undisclosed fee involved. Rotherham boss Andy Scott expects striker Adam Le Fondre to move on in the transfer window. Scott says he has players lined up to replace the forward. Gavin Mahon's deal at Notts County is a pay-as-you-play deal. The veteran has had an injury hit time and the deal runs only until January. Stalybridge, under the management of Jimmy Harvey, have warned supporters that the club cannot function on its current gates of 450. The Conf North side is full time this season. In his latest blog on the FL website, Sammy McIlroy claims Swindon spent £300,000 on latest signing Lukas Magera. The Czech international was reported to be a free transfer after his Romanian side were relegated. Forest Green striker Reece Styche has signed a new three year deal with the club after rejecting a move to Luton. The 22 year old only turned full time this summer. The Gumpers have also turned the tables on Luton by tabling a bid for their striker Robbie Willmott. Fleetwood have won the race for Halifax striker Jamie Vardy, signing the player for an undisclosed fee. Bradford have said they are not looking for applicants for their vacant managerial post as they have already identified the candidates they want to speak to. Accrington boss John Coleman and Dagenham's John Still may again be targets although the bookies have installed former Colchester and Charlton boss Phil Parkinson as the odds-on favourite. Burton have loaned young striker James Ellison to Alfreton for an initial month. The former Liverpool trainee made only three sub appearances for the Brewers since signing a two year deal last summer. Accrington have signed striker Padraig Amond until the end of the season. The Irishman spent last season in the Portugese top flight but failed to score in 17 appearances, although he had a prolific spell with Sligo Rovers in his home country previously. Swansea manager Brendan Rodgers has hinted that he hopes that he can agree a longer deal for keeper David Cornell to stay at Edgar Street. "I was desperate to get David Cornell out on loan," said Rodgers. "And thankfully we have now done that." Cornell has already made two starts for the Bulls and impressed manager Jamie Pitman. Meanwhile AFC Wimbledon has confirmed that 337 Hereford United watched the game between the two clubs at Kingsmeadow last Saturday. Bradford boss Peter Jackson has become the first League Two managerial casualty after resigning his post. Jackson only took over in the summer on a permanent basis after taking caretaker charge for the final third of last season. His summer rebuilding has seen the club collect just one point and lose their last two games without scoring. Blackpool's teenage forward Thomas Barkhuizen has been confirmed as the second loan signing of the day by the Bulls. "I'm really pleased with how things are going, I was cramping up towards the end in both hamstrings but that's only my second 90 minutes in seven months so it's just nice to get through a full game. "I've been training really hard on the training ground and in the gym as well and I actually feel better than I did before the injury, I think I've come back stronger physically and mentally and I think that my knowledge of the game is a bit better as well. "The gaffer has been helping me in terms of taking my man on in different ways and I'm feeling good and really confident about the season ahead." The teenager also played 37 minutes of their Carling Cup match with Sheff Weds. The Bulls have confirmed the loan signing of Will Evans. 19 year old Central Defender Evans is in the second year of his first pro contract with Swindon, making one appearance for the first team at the County Ground. He joins the Bulls on a three month loan as reported earlier. He will not be allowed to play when the Bulls face Swindon later in the season. Meanwhile, Rob Purdie has told his Twitter followers that he has been ruled out of Saturday's trip to Bristol Rovers. In other news Rochdale, who were linked to Delroy Facey, have signed one-time Bulls trialist Matthew Barnes-Homer on loan from Luton until January. They are also reported to have had an offer for Macclesfield's Emile Sinclair rejected. The Bulls trip to Shrewsbury on September 10th has - unsurprisingly - been made all ticket for travelling Bulls. The club will release full details on ticketing arrangements shortly. Meanwhile the club will be announcing two loan signings this afternoon. One is expected to be Swindon defender Will Evans. With fans holding a vigil at Home Park until their match on Saturday, Plymouth have a tense 24 hours to see if their preferred bidder finally comes up with cash to rescue the club. Bishop International have until 5pm on Friday to deposit close to £6million with the Administrator to complete their purchase. Chief Kevin Heaney has repeatedly said the funds are available but has missed several previous deadlines, while the Football League have so far failed to pass the deal after expressing 'several concerns' over the deal two weeks ago. Should the funds fail to arrive, the Administrator will turn to previously rejected bidders James Brent and Paul Buttivant for an immediate cash injection. A six-figure sum would be required on September 1st to cover the wage bill, with a second six-figure sum due two weeks later. Neither Brent nor Buttivant currently want to commit funds with no guarantees, with both expected to take several weeks to complete any deal. That means that, should Bishop International renege on their promises, the Pilgrims will again be seeking the goodwill of creditors and staff to carry on trading. That goodwill is beginning to run out with Stephane Zubar, one of the few players remaining from last season, quitting the club this morning for 'personal reasons'. Several of the off-field staff have also left in recent weeks to seek guaranteed wages elsewhere and pay their bills. On the pitch, Plymouth face rock-bottom Crewe on Saturday. The Bulls travel to the Memorial Ground looking for their first League Two win of the season. The two sides last met in a Johnstones Paint Trophy match at Edgar Street nearly two years ago. That goalless draw saw the Bulls win on penalties to progress with only Adam Bartlett and Kenny Lunt surviving in the Bulls squad from that night. The previous season the Bulls had been relegated from League One, losing both matches to the Pirates. Steve Guinan scored in the away match but it was a mere consolation as the hosts had already scored six. The Pirates sit ninth in the early table but are yet to show signs of the firepower and ability that Paul Buckle assembled in the summer. Tuesday's penalties win over Watford will have sapped their energy levels, while last Saturday's goalless match with Macclesfield suggested they can be stifled. Two former Bulls could be on parade on Saturday with Craig Stanley and Joe Anyinsah both in their squad. Stanley has been a regular starter so far, but Anyinsah has missed the last two matches with injury and remains a doubt. The Bulls' ability to perform better on the road seems to have carried into the new season. Tuesday's game at Villa Park might have been a long rearguard action, but it renewed confidence and belief both on and off the pitch. Two of the outstanding performers that night will now face their former side on Saturday. Ryan Green returns to the Memorial Ground after an injury hit three year spell there that split his time at Edgar Street, while Harry Pell makes a swift return barely two months after leaving. Pell is their current Young Player of the Year, and will be wanting to show the fans that voted him that award quite what they are missing. Bristol Rovers vs Hereford United, Memorial Ground, Saturday 27th August, 3.00pm. Rotherham have denied that striker Adam Le Fondre has submitted a transfer request. Several reports surfaced yesterday that the 24 year old had put in the demand, with Sheff Weds and Coventry claimed to be bidding for the former Rochdale man. Bradford boss Peter Jackson says he has rung 19 managers in two days looking for a loan striker. Only one of the six forwards currently at the club was playing League football last season. Wrexham's supporters have voted overwhelmingly in favour of carry out their takeover of the club. The Supporters Trust can now finalise financial details ahead of completion. Crawley have loaned winger Willie Gibson to SPL side St Jonhnstone until January. The 27 year old Scot is reported to be homesick after signing from Dunfermline in January. Former Bull Gavin Mahon is expected to sign for Notts County. He has been training with Watford for fitness. Dagenham striker Josh Scott will miss six weeks as he needs surgery on a knee cartilage problem. The 26 year old hasn't played since January after being diagnosed with a blood clot on his lung, but had been in pre-season training before the latest injury. Leyton Orient have, along with Spurs, been granted a judicial review of the decision to hand the Olympic stadium to West Ham. The League One side claim the Hammers will move onto their territory and destroy their support with cheap ticket offers. The Memorial Stadium has a capacity of just over 12000 with visiting fans usually accommodated on an open terrace to one side of the Uplands Stand. Some seats are often provided in the adjacent canvas covered South Stand at the end of the pitch. Admission is believed to be £18 for adults, £11 for over 65’s and Students (NUS card) and £10 for U16’s. There is a £2 reduction for tickets paid for in advance of matchdays. HUISA – Depart from Radford’s at 12.30pm with a fare of £13 (Members £11). Seats can be booked through HUFC offices (08442 761939). BY CAR - From Hereford, you have a choice of going via Gloucester (M5) or Monmouth (Newport or Chepstow M4). If travelling on the M5, leave the M5 at J15 and join the M4 east (sign London). Leave the M4 at J19 and join the M32 (sign Bristol). After just over 3 miles, leave the M32 at J2 then, at the roundabout, take the third exit (sign Horfield and Southmead). Follow this road through a division and a roundabout (third exit) following signs for Memorial Stadium into Muller Road. After 1.4 miles you will reach a signal controlled cross road. Turn left into Filton Avenue where you will find the ground on your left. For those travelling via Monmouth and the M4, simply follow the above directions from J19. You are reminded of the Severn Bridge crossing fee (Car £5.30, Minibus £10.60, Coach £15.90) when returning home. The Bristol official site suggests that street parking around the ground is relatively easy although parking in Filton Avenue itself might be difficult unless you arrive a couple of days in advance. Muller Road and Gloucester Road together with their side streets are recommended. Distance, dependent on route, is around 65 miles. You should allow one and a half hours. Postcode is BS7 0BF. TRAIN - Those taking the rail option are advised to head for Bristol Parkway as a main station then take a number 73 bus for the two mile trip to the ground. Montpelier and Filton Abbey Wood stations are also close to the ground. ALEHOUSES - For recent games, Bristol Police directed thirsty fans to The Wellington which is on Gloucester Road about 400 yards before the turning to the stadium. I would imagine (unconfirmed) that the same Alehouse would be available on Saturday for pre-match refreshments. The Pub is a sizeable unit with Sky TV and offers a good range of fluid including at least one real ale. I will post an update if I hear any changes from Bristol police. “The Annexe” In Nevil Road usually has a good range of real ales and is generally considered to be friendly. It can be found by following signs for the County Cricket Ground. The Inn on The Green can be found on Gloucester Road although good behaviour is expected. Other wise there is no shortage of Pubs in the area although Pirates fans regard the Wellington and the John Cobat as home Pubs. The Queen Vic on Gloucester Road is also understood to accept visitors. The Bristol Fryer Chip shop is on Gloucester Road and The Gas traditionally sell excellent pasties from the refreshment kiosk at the back of the visitor’s terrace.